What are the real costs of eating cheaply? I've talked a little about time and specialized equipment, but there are other considerations that are so basic as to be almost invisible. One of them is kitchen equipment. The figures in the Thrifty Food Plan are based on one important assumption: "All meals and snacks are purchased at stores and prepared at home." I have a few nice pots and pans, but for the most part I don't have a spectacularly equipped kitchen. However, through the years I have accumulated the things I need to cook the way I do. Most of it is standard: a small skillet, a small saucepan, a medium-large saute pan, a large pot, a muffin tin, a loaf pan, a large cooking spoon, a small whisk, tongs. There are a few specialty items: stock pot and an extra-large muffin tin for making and storing vegetable stock. A yogurt maker. An outdoor grill. I accumulated my kitchen equipment over time. A family fallen on hard times would have some of these things already. You can get a basic kitchen set-up for under $200. But for people starting out—say college students, or newlyweds, or divorcees—who has an extra $200? A few years ago, I read a book called The Complete Tightwad Gazette by Amy Dacyczyn (pronounced "decision"). I return to it from time to time for inspiration, and each time I re-read it I go a little insane. Saving money is a lifestyle for Ms. Dacyczyn and she infects me with a fever not to waste anything. She saves money on food by a combination of price-tracking, careful shopping, frugal meals, and growing and preserving a few items. One thing I like about her approach is that she includes the cost of seeds, canning jars, and associated equipment in the cost of her food. It's imminently sensible. Ms. Dacyczyn's primary concern is cost-savings. Growing and canning your own green beans is not frugal if the cost of fertilizer and canning equipment, added together, cost more than the cheapest commercially canned green beans you can buy. I was reminded of this in Week 1 when I purchased 2 2-cup Pyrex containers and 1 4-cup Pyrex container (with lids). That Pyrex was one of the things that sent my grocery bill into the stratosphere. Food stamps wouldn't pay for Pyrex, of course, but if you had on hand an extra $15.75 in cash, what do you think you would do? Spend it on three Pyrex containers, or on some extra food for your family? On the other hand, every document I've seen advising Food Stamp recipients on how best to spend their monthly allotment mentions scratch cooking and "planned leftovers" as two strategies for getting the most out of your food dollars. I agree. As you've seen, I make our lunches with last night's food. But without containers for refrigerating and freezing what you make, how can you cook ahead? For any style of cooking, there are items even more basic than those: A working stove and oven. A refrigerator with a freezer. A microwave. Cookbooks. Shared housing can be an inexpensive choice for people with low incomes, but in planning to store and reuse the food I cooked, would living with other people be problematic? I can be sure that my leftovers will be eaten by my husband or me. I don't expect I could count on that if I was sharing a refrigerator with others—especially if they were having money issues, too. And what about the homeless? Sleeping in your car, you might have a camp stove to use, but no refrigerator. In a homeless shelter, would you even have that? Help people acquire home food preservation equipment, including freezers, canning jars, dehydrators. For about $200 (internet catalog prices), a basic set of new equipment could be bought including a boiling water canner, dehydrator, grain grinder, pressure canner. For about $1500, larger equipment could be bought (including a pasta maker and oat roller) that could be loaned for use by individuals or groups or maintained at (for example) a church kitchen and made available for use by people wanting to do home preservation of foods but who don't have the equipment. I had more to say about the implications of this project in an email to the good people at WorldChanging. Bob appears to be running for Mayor of Oklahoma City now, by the way. If you live there, consider voting for him. I have my usual breakfast before we go work out, and then when I come home, I eat breakfast again: oatmeal and milk. Lunch, for me, is Chilaquiles, a salad, and an apple. That's too much for Jesse, and he leaves the apple for another day. The Terra Firma box is filled with the usual suspects: asparagus, salad mix, sugar snap peas, cherries, and small red potatoes. This is the hardest thing about eating out of the box. I have a few good asparagus recipes in me, but coming up with something new week after week can be very difficult. Like as not, we end up eating the same few dishes over and over again until the vegetable line-up changes. For very seasonal items, that's not so bad—it's a month of that food and then it's gone for a year. But other items are harder. At least we didn't get more carrots. Lunch: Chilaquiles (1), Salad with Raspberry Vinaigrette Dressing; apple (1). Time to dinner: 1 hour; Active cooking time: 30 minutes. At lunch today, I used up the last of the Raspberry Vinaigrette Dressing, so it's time for a change of pace. It takes me 3 minutes to mix up a garlicky vinaigrette. 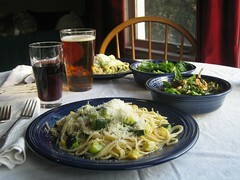 Since I opened my box last week, I've been looking forward to this dinner: Spaghetti with Zucchini and Basil [pdf]. It really is very simple. Cut 12 ounces of zucchini lengthwise into quarters and then into 1/2 inch pieces. Saute over medium with 2 chopped garlic cloves in 3 TB of olive oil until the zucchini is browned in places (about 15 minutes) and then add about a quarter cup of milk and 1 teaspoon of dried basil and let it cook a few more minutes until the milk has reduced. Meanwhile, cook 3 ounces of spaghetti per person. When it's done, sauce the noodles, add 1/4 of a cup mixed pecorino and parmesan cheeses, and serve. It's better with fresh basil, of course, but this version is surprisingly good. I put the plates on the table and I can tell from his face that Jesse thinks this is too much. He's right. I've cooked 7 ounces of dry pasta when I know from experience that 3 each is plenty. I tell Jesse just to eat what he can and to take the rest to work tomorrow for lunch. He agrees—but by the end of the meal, his plate is empty, the pasta tastes so good. Deborah Madison's version of this dish is the one to make, by the way. Madhur Jaffrey's recipe is surprisingly unimpressive. Wednesday total: $6.67. Remaining weekly allowance: $41.58. Thanks for today's post. I've been reading many of your posts thinking, there is no way an average poor person could be able to do some of things you've mentioned. I appreciate your posts and what you are attempting to do. I once thought about trying to live on $1 a day (which is what a large % of the world's population lives on) and after thinking about it decided it was impossible becuase I would have spent my $1 on the refridgerator and stove, not to mention gas to get to the grocery store. I grew up in a low-income neighborhood with quite a horrible supermarket in terms of fresh anything, and I remember cooking meals with the few tools my Mom had: a Dutch oven, one medium saucepan, a 7" chef's knife, and a cast-iron skillet. When I was in college, I had to get creative living on campus just making meals with a hot plate and an electric kettle. Anywho, reading through this experiment and hearing about the congressmen attempting the same feat is inspiring (and probably much harder to do feeding a family instead of one person; I could probably eat like a king on $74/week!). I did some volunteering a few years ago with a group called Yellow Brick Road here in Portland, OR. The volunteering was outreach to street kids. They have a totally different concept of time than you and I. Instead of thinking about next week or even tomorrow, they are simply thinking about getting through any particular day. Imagine how complicated that would make trying to do this! Thanks for continuing with this experiment. Barbara Ehrenreich's excellent Nickel And Dimed brings this out as well - she tries to mentor some of the sub-breadline workmates she's crewing with as a cleaner then realises to her embarrassment that the necessary investment to cook ahead, store portions etc etc is just utterly beyond the means of the genuinely poor. Will have to try the zucchini and basil! The handwringing over what "the poor" might or might not be able to do is full of assumptions about who those people might be. There are all sorts of people on assistance - unemployed, disabled, retired, displaced - and they all have different abilities and make different choices. Most people in our contry dont choose an organic or a vegetarian diet. Meat is a heavily subsidized industry in the USA, and organic produce is not. So is corn (which is a primary ingredient in most prepared foods). There is a built-in economic challenge to your diet that many other Americans do not face. Organic vegetarians do not benefit from most USDA subsidies. You are proving that you can survive (and thrive) on a budget equal to that of a Food Stamp recipient. It takes focus, and hard work, and some sacrifice. Your moderator is Rebecca Blood. Please be thoughtful and polite. » How did it begin?